The stopping potential Vc is found to be changing linearly with frequency of incident light being more negative for high frequency. An increase in frequency of the incident light increases the kinetic energy of the emitted electrons, so greater retarding potential is required to stop them completely. 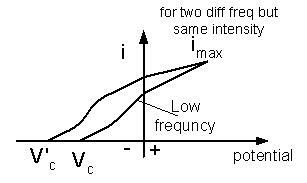 For a given frequency v, Vc measures the maximum kinetic energy Emax of photoelectrons that can reach plate C.
Where m is the mass of electron, e is charge of electron and Vmax is maximum velocity of electron. This means that work done by stopping potential must just be equal to maximum kinetic energy of an electron. The effect of changing incident frequency v can also be studied from the plot of photoelectric current Vs potential applied across CD, keeping the intensity of incident radiation same. From graph, we see that imax is same in all cases (for same intensity). From graph, as v increases, Vc becomes more negative. (Vc = 0). So for a frequency below f0 and f0' for two metals, there will not be any emission of photoelectrons. 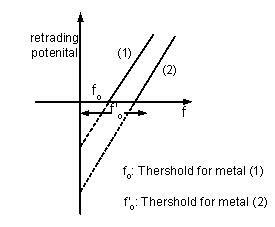 This minimum value of frequency of incident light below which the emission stops, however large the intensity of light may be, is called as threshold frequency.